The Hour and the Man is featured in our collection of Mystery Stories. Prince Lotarno rose slowly to his feet, casting one malignant glance at the prisoner before him. "You have heard," he said, "what is alleged against you. Have you anything to say in your defence?" "The time for talk is past," he cried. "This has been a fine farce of a fair trial. You need not have wasted so much time over what you call evidence. I knew my doom when I fell into your hands. I killed your brother; you will kill me. You have proven that I am a murderer and a robber; I could prove the same of you if you were bound hand and foot in my camp as I am bound in your castle. It is useless for me to tell you that I did not know he was your brother, else it would not have happened, for the small robber always respects the larger and more powerful thief. When a wolf is down, the other wolves devour him. I am down, and you will have my head cut off, or my body drawn asunder in your courtyard, whichever pleases your Excellency best. It is the fortune of war, and I do not complain. When I say that I am sorry I killed your brother, I merely mean I am sorry you were not the man who stood in his shoes when the shot was fired. You, having more men than I had, have scattered my followers and captured me. You may do with me what you please. My consolation is that the killing me will not bring to life the man who is shot, therefore conclude the farce that has dragged through so many weary hours. Pronounce my sentence. I am ready." "Your sentence is that on the fifteenth of January you shall be taken from your cell at four o'clock, conducted to the room of execution, and there beheaded." The Prince hesitated for a moment as he concluded the sentence, and seemed about to add something more, but apparently he remembered that a report of the trial was to go before the King, whose representative was present, and he was particularly desirous that nothing should go on the records which savoured of old-time malignity; for it was well known that his Majesty had a particular aversion to the ancient forms of torture that had obtained heretofore in his kingdom. Recollecting this, the Prince sat down. The brigand laughed again. His sentence was evidently not so gruesome as he had expected. He was a man who had lived all his life in the mountains, and he had had no means of knowing that more merciful measures had been introduced into the policy of the Government. "I will keep the appointment," he said jauntily, "unless I have a more pressing engagement." The brigand was led away to his cell. "I hope," said the Prince, "that you noted the defiant attitude of the prisoner." "I have not failed to do so, your Excellency," replied the ambassador. "I think," said the Prince, "that under the circumstances, his treatment has been most merciful." "I am certain, your Excellency," said the ambassador, "that his Majesty will be of the same opinion. For such a miscreant, beheading is too easy a death." The Prince was pleased to know that the opinion of the ambassador coincided so entirely with his own. The brigand Toza was taken to a cell in the northern tower, where, by climbing on a bench, he could get a view of the profound valley at the mouth of which the castle was situated. He well knew its impregnable position, commanding as it did, the entrance to the valley. He knew also that if he succeeded in escaping from the castle he was hemmed in by mountains practically unscalable, while the mouth of the gorge was so well guarded by the castle that it was impossible to get to the outer world through that gateway. Although he knew the mountains well, he realised that, with his band scattered, many killed, and the others fugitives, he would have a better chance of starving to death in the valley than of escaping out of it. He sat on the bench and thought over the situation. Why had the Prince been so merciful? He had expected torture, whereas he was to meet the easiest death that a man could die. He felt satisfied there was something in this that he could not understand. Perhaps they intended to starve him to death, now that the appearance of a fair trial was over. Things could be done in the dungeon of a castle that the outside world knew nothing of. His fears of starvation were speedily put to an end by the appearance of his gaoler with a better meal than he had had for some time; for during the last week he had wandered a fugitive in the mountains until captured by the Prince's men, who evidently had orders to bring him in alive. Why then were they so anxious not to kill him in a fair fight if he were now to be merely beheaded? "What is your name?" asked Toza of his gaoler. "I am called Paulo," was the answer. "Do you know that I am to be beheaded on the fifteenth of the month?" "I have heard so," answered the man. "And do you attend me until that time?" "I attend you while I am ordered to do so. If you talk much I may be replaced." "That, then, is a tip for silence, good Paulo," said the brigand. "I always treat well those who serve me well; I regret, therefore, that I have no money with me, and so cannot recompense you for good service." "That is not necessary," answered Paulo. "I receive my recompense from the steward." "Ah, but the recompense of the steward and the recompense of a brigand chief are two very different things. Are there so many pickings in your position that you are rich, Paulo?" "No; I am a poor man." "Well, under certain circumstances, I could make you rich." Paulo's eyes glistened, but he made no direct reply. Finally he said, in a frightened whisper, "I have tarried too long, I am watched. By- and-by the vigilance will be relaxed, and then we may perhaps talk of riches." With that the gaoler took his departure. The brigand laughed softly to himself. "Evidently," he said, "Paulo is not above the reach of a bribe. We will have further talk on the subject when the watchfulness is relaxed." And so it grew to be a question of which should trust the other. The brigand asserted that hidden in the mountains he had gold and jewels, and these he would give to Paulo if he could contrive his escape from the castle. "Once free of the castle, I can soon make my way out of the valley," said the brigand. "I am not so sure of that," answered Paulo. "The castle is well guarded, and when it is discovered that you have escaped, the alarm- bell will be rung, and after that not a mouse can leave the valley without the soldiers knowing it." The brigand pondered on the situation for some time, and at last said, "I know the mountains well." "Yes;" said Paulo, "but you are one man, and the soldiers of the Prince are many. Perhaps," he added, "if it were made worth my while, I could show you that I know the mountains even better than you do." "What do you mean?" asked the brigand, in an excited whisper. "Do you know the tunnel?" inquired Paulo, with an anxious glance towards the door. "What tunnel? I never heard of any." "But it exists, nevertheless; a tunnel through the mountains to the world outside." "A tunnel through the mountains? Nonsense!" cried the brigand. "I should have known of it if one existed. The work would be too great to accomplish." "It was made long before your day, or mine either. If the castle had fallen, then those who were inside could escape through the tunnel. Few know of the entrance; it is near the waterfall up the valley, and is covered with brushwood. What will you give me to place you at the entrance of that tunnel?" The brigand looked at Paulo sternly for a few moments, then he answered slowly, "Everything I possess." "And how much is that?" asked Paulo. "It is more than you will ever earn by serving the Prince." "Will you tell me where it is before I help you to escape from the castle and lead you to the tunnel?" "Will you tell me now?" "No; bring me a paper to-morrow, and I will draw a plan showing you how to get it." When his gaoler appeared, the day after Toza had given the plan, the brigand asked eagerly, "Did you find the treasure?" "I did," said Paulo quietly. "And will you keep your word?--will you get me out of the castle?" "I will get you out of the castle and lead you to the entrance of the tunnel, but after that you must look to yourself." "Certainly," said Toza, "that was the bargain. Once out of this accursed valley, I can defy all the princes in Christendom. Have you a rope?" "We shall need none," said the gaoler. "I will come for you at midnight, and take you out of the castle by the secret passage; then your escape will not be noticed until morning." At midnight his gaoler came and led Toza through many a tortuous passage, the two men pausing now and then, holding their breaths anxiously as they came to an open court through which a guard paced. At last they were outside of the castle at one hour past midnight. The brigand drew a long breath of relief when he was once again out in the free air. "Where is your tunnel?" he asked, in a somewhat distrustful whisper of his guide. "Hush!" was the low answer. "It is only a short distance from the castle, but every inch is guarded, and we cannot go direct; we must make for the other side of the valley and come to it from the north." "What!" cried Toza in amazement, "traverse the whole valley for a tunnel a few yards away?" "It is the only safe plan," said Paulo. "If you wish to go by the direct way, I must leave you to your own devices." "I am in your hands," said the brigand with a sigh. "Take me where you will, so long as you lead me to the entrance of the tunnel." They passed down and down around the heights on which the castle stood, and crossed the purling little river by means of stepping-stones. Once Toza fell into the water, but was rescued by his guide. There was still no alarm from the castle as daylight began to break. As it grew more light they both crawled into a cave which had a low opening difficult to find, and there Paulo gave the brigand his breakfast, which he took from a little bag slung by a strap across his shoulder. "What are we going to do for food if we are to be days between here and the tunnel?" asked Toza. "Oh, I have arranged for that, and a quantity of food has been placed where we are most likely to want it. I will get it while you sleep." "But if you are captured, what am I to do?" asked Toza. "Can you not tell me now how to find the tunnel, as I told you how to find the treasure?" Paulo pondered over this for a moment, and then said, "Yes; I think it would be the safer way. You must follow the stream until you reach the place where the torrent from the east joins it. Among the hills there is a waterfall, and halfway up the precipice on a shelf of rock there are sticks and bushes. Clear them away, and you will find the entrance to the tunnel. Go through the tunnel until you come to a door, which is bolted on this side. When you have passed through, you will see the end of your journey." Shortly after daybreak the big bell of the castle began to toll, and before noon the soldiers were beating the bushes all around them. They were so close that the two men could hear their voices from their hiding-place, where they lay in their wet clothes, breathlessly expecting every moment to be discovered. The conversation of two soldiers, who were nearest them, nearly caused the hearts of the hiding listeners to stop beating. "Is there not a cave near here?" asked one. "Let us search for it!" "Nonsense," said the other. "I tell you that they could not have come this far already." "Why could they not have escaped when the guard changed at midnight?" insisted the first speaker. "Because Paulo was seen crossing the courtyard at midnight, and they could have had no other chance of getting away until just before daybreak." This answer seemed to satisfy his comrade, and the search was given up just as they were about to come upon the fugitives. It was a narrow escape, and, brave as the robber was, he looked pale, while Paulo was in a state of collapse. Many times during the nights and days that followed, the brigand and his guide almost fell into the hands of the minions of the Prince. Exposure, privation, semi-starvation, and, worse than all, the alternate wrenchings of hope and fear, began to tell upon the stalwart frame of the brigand. Some days and nights of cold winter rain added to their misery. They dare not seek shelter, for every habitable place was watched. When daylight overtook them on their last night's crawl through the valley, they were within a short distance of the waterfall, whose low roar now came soothingly down to them. "Never mind the daylight," said Toza; "let us push on and reach the tunnel." "I can go no farther," moaned Paulo; "I am exhausted." "Nonsense," cried Toza; "it is but a short distance." "The distance is greater than you think; besides, we are in full view of the castle. Would you risk everything now that the game is nearly won? You must not forget that the stake is your head; and remember what day this is." "What day is it?" asked the brigand, turning on his guide. "It is the fifteenth of January, the day on which you were to be executed." Toza caught his breath sharply. Danger and want had made a coward of him and he shuddered now, which he had not done when he was on his trial and condemned to death. "How do you know it is the fifteenth?" he asked at last. Paulo held up his stick, notched after the method of Robinson Crusoe. "I am not so strong as you are, and if you will let me rest here until the afternoon, I am willing to make a last effort, and try to reach the entrance of the tunnel." "Very well," said Toza shortly. As they lay there that forenoon neither could sleep. The noise of the waterfall was music to the ears of both; their long toilsome journey was almost over. "What did you do with the gold that you found in the mountains?" asked Toza suddenly. Paulo was taken unawares, and answered, without thinking, "I left it where it was. I will get it after." The brigand said nothing, but that remark condemned Paulo to death. Toza resolved to murder him as soon as they were well out of the tunnel, and get the gold himself. They left their hiding-place shortly before twelve o'clock, but their progress was so slow, crawling, as they had to do, up the steep side of the mountain, under cover of bushes and trees, that it was well after three when they came to the waterfall, which they crossed, as best they could, on stones and logs. "There," said Toza, shaking himself, "that is our last wetting. Now for the tunnel!" 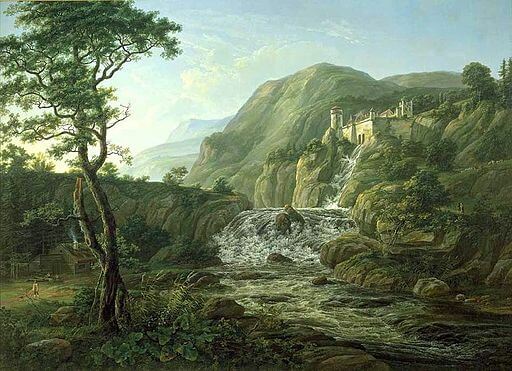 The rocky sides of the waterfall hid them from view of the castle, but Paulo called the brigand's attention to the fact that they could be easily seen from the other side of the valley. "It doesn't matter now," said Toza; "lead the way as quickly as you can to the mouth of the cavern." Paulo scrambled on until he reached a shelf about halfway up the cataract; he threw aside bushes, brambles, and logs, speedily disclosing a hole large enough to admit a man. "You go first," said Paulo, standing aside. "No," answered Toza; "you know the way, and must go first. You cannot think that I wish to harm you--I am completely unarmed. "Nevertheless," said Paulo, "I shall not go first. I did not like the way you looked at me when I told you the gold was still in the hills. I admit that I distrust you." "Oh, very well," laughed Toza, "it doesn't really matter." And he crawled into the hole in the rock, Paulo following him. Before long the tunnel enlarged so that a man could stand upright. "Stop!" said Paulo; "there is the door near here." "Yes," said the robber, "I remember that you spoke of a door," adding, however, "What is it for, and why is it locked?" "It is bolted on this side," answered Paulo, "and we shall have no difficulty in opening it." "What is it for?" repeated the brigand. "It is to prevent the current of air running through the tunnel and blowing away the obstruction at this end," said the guide. "Here it is," said Toza, as he felt down its edge for the bolt. The bolt drew back easily, and the door opened. The next instant the brigand was pushed rudely into a room, and he heard the bolt thrust back into its place almost simultaneously with the noise of the closing door. For a moment his eyes were dazzled by the light. He was in an apartment blazing with torches held by a dozen men standing about. In the centre of the room was a block covered with black cloth, and beside it stood a masked executioner resting the corner of a gleaming axe on the black draped block, with his hands crossed over the end of the axe's handle. The Prince stood there surrounded by his ministers. Above his head was a clock, with the minute hand pointed to the hour of four. "You are just in time!" said the Prince grimly; "we are waiting for you!" Add The Hour and the Man to your own personal library.